What happens to data when Forms has been uninstalled? When you sign up for Plumsail Account, you may be asked to enter your name and email address. We collect information from you when you install Plumsail Forms for the first time, such as the domain names for SharePoint. Forms for SharePoint send all the data directly to SharePoint, we have no access to it. All operations are performed over secure encrypted HTTPS connection. We never sell any personal info to third parties. When you install Plumsail Forms to SharePoint Online, you need to add your domain to Plumsail Account. 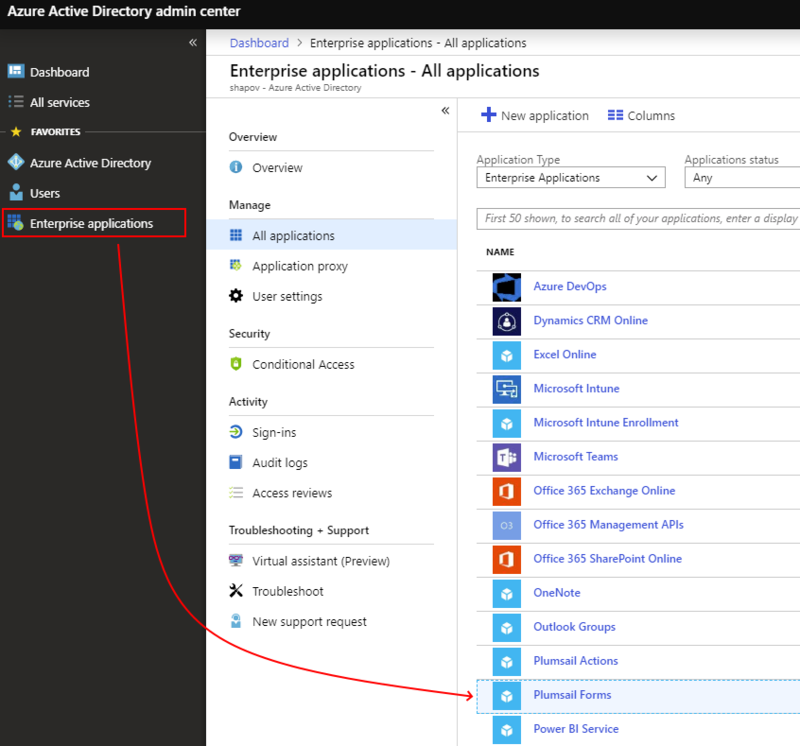 This requires Global Admin (aka Tenant Admin permissions) to install the Azure Active Directory enterprise application. These permissions are transferred to the app itself, and it uses them to publish forms to any site collection or site that you have on the Tenant. It enables scripting capabilities on a target site, and is the easiest and most user-friendly option there is to ensure publishing goes smoothly for any site. We are automatically gathering some data and store it in log files. This information includes several activities as internet protocol addresses, browser, internet service provider, referring/exit pages, operating system, date/time stamp, and click stream data. Our application log files are subject to the same strict data security policies and procedures as apply to the application databases. We do this to improve the support that we offer you. Log files are stored for a few days, then they are removed permanently. When you uninstall Forms, logs are removed permanently. Local storage data can be cleared manually in your browser. Information about Forms downloads and installations are still stored on our servers and can be removed by request. You can send a request to support@plumsail.com. As stated above, we store information about Forms installations, downloads and log files on our servers. Log files are stored for a few days, then they are removed permanently. Our services and storages are scanned on a regular basis for security holes and known vulnerabilities in order to make your visit to our site as safe as possible. Information about Forms installations and log files are contained behind secured networks and is only accessible by a limited number of persons who have special access rights to such systems, and are required to keep the information confidential. In addition, all sensitive information you supply is encrypted via Secure Socket Layer (SSL) technology. All data transited between you and SharePoint is encrypted and sent using HTTPS.